The 2020 DeMarini Gattaca is a one-of-a-kind multi-piece bat with an alloy barrel and composite handle that attempts to maximize distance on well-struck baseballs via grooves on the interior of the barrel. It also offers another interesting new feature, DeMarini’s new Adjustable on Demand (AOD) knob that can change the length of the bat pitch to pitch. Lastly, its the first bat ever to offer a specific model for left and right handed hitters. Check out DeMarini’s Gattaca page for more detailed tech specs, and read on for our unbiased review. The Gattaca has a different look for lefties and righties. They have the same graphite base and mirrored graphics. The left handed version uses a sky blue while the right handed version uses a fiery red. DeMarini decided to keep their ‘D’ logo solid and color it yellow-gold. Above, you’ll see the barrel graphics for the left-handed version. The righty model mirrors these in red. 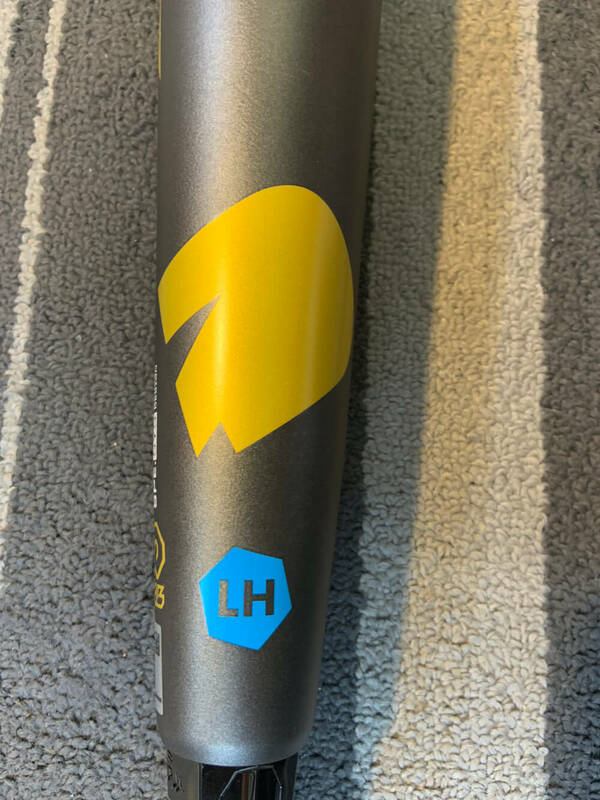 Here’s a good look at the DeMarini’s 3Fusion handle and connection piece. The stock grip has a cool pattern and AOD knob has an interesting look to it. The 33” and 34” models each have a different swing weight. The 34” is designed for power hitters and as a result is more end-loaded. It’s a hefty swing, but if you’re a stronger player who can handle the extra weight, it will be a great investment for your power hitting career. Although I did not swing it, the 33” has a more balanced swing weight that will be more suitable for players looking for more barrel control. As someone who loves the feel of two-piece hybrids, I thought the Gattaca was a ton of fun to swing. I was swinging the 34” model, and thought that it had a very similar feel to DeMarini’s Voodoo Insane. They use a very similar handle in addition to having a similar barrel profile and weight distribution. Although some bats play with the thickness of the barrel metal, the Gattaca is the only bat on the market to have interior grooves, and its the key insight that’s got DeMarini so hyped about the Gattaca. Do the Grooves Really Work Though? My answer is yes, although you probably won’t feel it. The Gattaca is not a cheat code. Hitters still must barrel up the ball in order to really see it fly. DeMarini’s data had hitters see a 10% increase in balls hit at optimal flight attributes when using the Gattaca. It still performs at the BBCOR standard, so it’s not increasing your maximum distance and exit velocity, but it is helping you to reach your max more consistently. The 33” and 34” versions are designed for different types of hitters. As I said before, I was swinging the 34”, which is clearly designed for power hitters with a stiffer handle and long barrel that just plows through baseballs. I wasn’t able to swing the 33” model, but considering the similarities between the 34” and Voodoo Insane, I imagine it is going to feel very similar to the Voodoo Balanced. It’s exciting to see DeMarini’s innovative ideas in action. I appreciate DeMarini’s efforts to release unique products and on the Gattaca, they did a fantastic job. The variety of new features on the Gattaca make it unique from any bat on the market, and I expect the Gattaca to be very popular throughout all levels of baseball this year. I would not be surprised to see more companies implementing innovations similar to the Gattaca.